We take away ALL the worry and administration. You own the solution and the outputs - we take the responsibility of managing the process. Wherever there is a need for data to be collected from multiple locations quickly and cost effectively then ADaPT®ability provides the solution. It is a specialist software application that enables data to be collected on-line. Results are displayed graphically so that the results can be easily analysed. The (competency) questionnaire or survey is posted in a private area of our web site and the respondents simply complete it on-line. We do the rest! You get the results back in an email or as a hard copy report. Respondents are sent an email with a URL that takes them to a dedicated site that we set up for you. Questionnaires are completed on line and respondents simply click a button when they have completed the questions. We then analyse the results and return the output to the respondents or to you as appropriate. The results are provided in a graphical and numerical format that allows easy analysis and displays the results clearly. In the same way as you buy a trip to the health farm or a day in a hot air balloon or driving Formula 3 you can have your survey/profiles 'in a box'. We provide the freedom for you to have your questionnaire 'posted' on a secure area of our web site where it can be completed by the target audience. We will do all the work processing the data and producing the outputs. You sit back and have the results without the 'hassle'. The software is economical to use  you simply buy profiles, by phone or Email, as you need them. This just in time approach means that the cost can be spread throughout the year. It means that if you have a survey or assessment to carry out you simply buy enough profiles to meet the need. ADaPT®ability can be used for a variety of needs. This flexibility makes it an indispensable analysis, research, development and assessment tool. 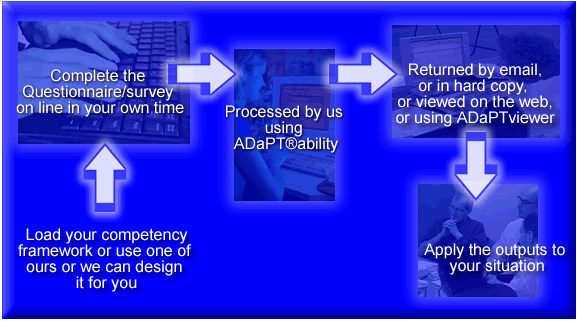 ADaPT®ability can be used for personal development, training needs analysis, succession planning and for appraisals. This flexibility makes it an indispensable HR tool. Minimum one-off set up cost is £150. Once you have signed-up and are using ADaPT®ability you can add additional questionnaires (at £45 each) and buy profiles as you require. Profiles are sent to the trainer/consultant (or individual  if required) in a printable format via email or in hard copy by post. They can buy any number of profiles and use them on a call-off basis. £45 per page set-up (minimum cost £150 including profiles). Profiles are sent to the trainer/consultant (or individual  if required) as a bound Profile Report and can also be viewed on screen using ADaPT®viewer which comes FREE when you purchase 6 or more profiles. Profiles show each of the 360º aspects separately; together and as an average of the entire audience. The 360º Report includes comments added by those completing the questionnaire to explain the scores. ADaPT®ability also offers a team/group profiling module, which enables you to explore the strengths and weaknesses of a team/group and to audit the areas for development. ADaPT®ability is a versatile program, which offers organisations a complete tool for 360° profiling. Resource will provide you with a tailored service to meet your needs. You can use your own predefined competencies, purchase 'ready made' competencies from Resource or we can help you to produce a 'competency map'. We will also support you through the feedback process if you wish. We also provide training in the methods of identifying competencies so that you can establish a cadre of people across the organisation, if required. If you would like more information about the program and the support we offer please contact us. Profiles can be purchased on an as needed basis. In this way you have complete control over the process - how much you use it when and where. We can also support you in identifying your organisational Skills, Attributes and Knowledge competencies and in producing your 'Competency Map'. We also provide training in the methods of identifying competencies so that you can establish a cadre of people across the organisation, if required. If you would like more information about the options and the support we offer please contact us.